Need more storage? Check out the Side Lofted Barn portable building by Express Buildings at Country Roads. Why pay rent on a storage unit when you can own? Buy or rent-to-own your own custom storage building which are American made and built right here in western Kentucky by skilled craftsmen. Absolutely No Credit Check! Free Delivery & Set Up! Monthly payments as low as $54/Month (8X8 model). 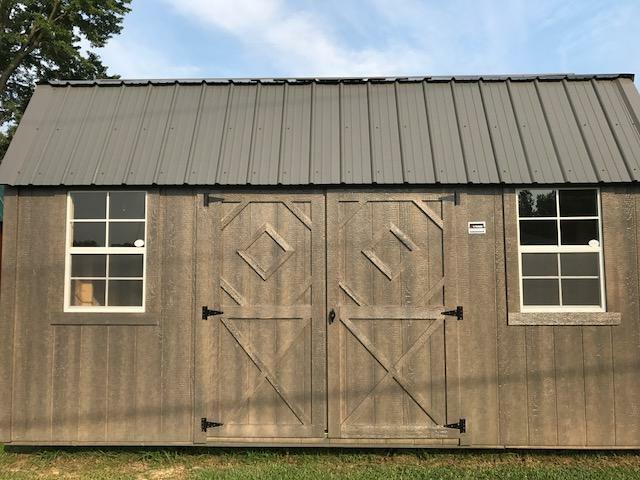 The Side Lofted Barn is available in a variety of sizes and configurations including: 8x8; 8x10; 8x12; 10x10; 10x12; 10x14; 10x16; 10x20; 12x12; 12x14; 12x16; 12x20; 12x24; 12x30. Country Roads is your authorized Express Buildings dealer so give us a call at (270) 338-2732 for details or stop in and tour our many in-stock model buildings on our large lot. Express Storage Buildings manufacturers some of the highest quality buildings at an affordable price and offer a 5 Year Warranty on Craftsmanship! Many models, sizes, and options to choose from including: barn, portable office, lofted barn, utility, cottage shed, garage shed, portable garage, and side lofted barn. Sizes from 8'X8' to 14' X44'. Give us a call with any questions at (270) 338-2732 or visit Country Roads at 615 Greene Drive in Greenville, KY.